Katie Price was left in agony after she suffered an allergic reaction to the penicillin in the antibiotics she was given after she had her veneers fitted last week. 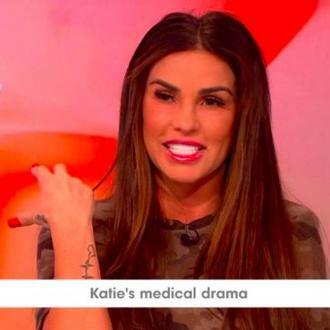 Katie Price was ''really ill for days'' after she suffered a severe allergic reaction to the antibiotics she was given following the surgery she had on her teeth last week. The 39-year-old former glamour model - who is allergic to penicillin - was left crying in agony earlier this week after she experienced an adverse reaction to the medication she was prescribed after having her veneers updated in Turkey. Speaking on 'Loose Women' on Thursday (09.11.17), she shared: ''Basically when I was younger, I fell off a skateboard and I've had all cosmetic procedures and stuff but this is the only cosmetic procedure that I do actually need. So when I was younger, I fell off a skateboard and cracked all my front teeth and I needed veneers. They were 10 years old my veneers so I needed them replaced. The brunette beauty went back to Turkey earlier this week to have her temporaries ripped out and her permanent gnashers slotted in and, although her mouth is still swollen and bruised, she couldn't be happier with her new dazzling smile.